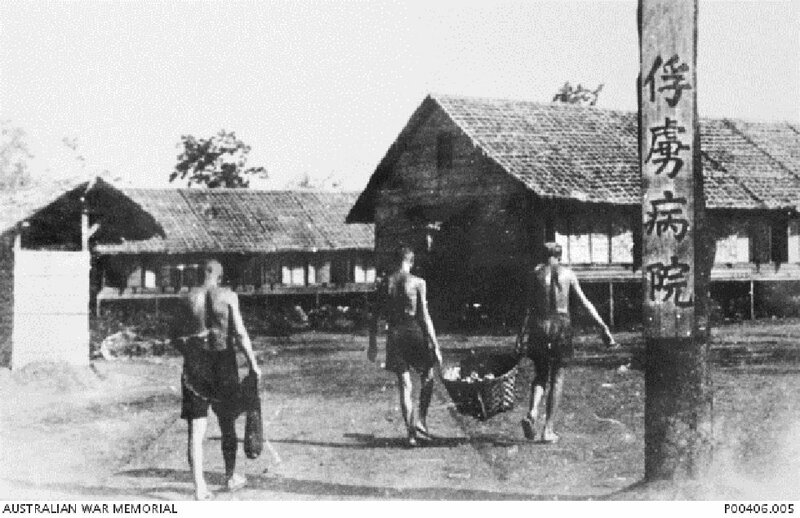 Captioned "POW hospital" in Japanese, the image shows POWs outside the POW hospital in Nakom Paton, 1944. Image courtesy of the Australian War Memorial. 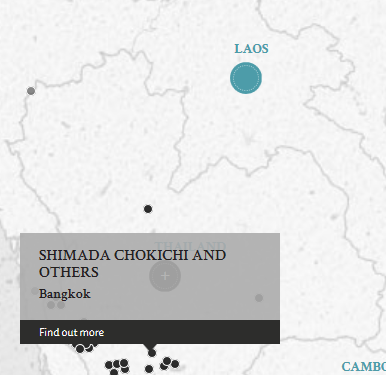 Warrant Officer Shimada Chokichi, Sergeant Yamasaki Yorikazu, civilian interpreter Miyakawa Gengichiro, Corporal Morita Yasumasu and Superior Private Ato Saichi were all former Kempeitai personnel based in Bangkok, Siam. They were charged with the ill-treatment of certain civilians who were residents of Bangkok at that time. These civilians, both Chinese and Indians, had been arrested for suspected pro-allied and anti-Japanese activities. During interrogation and detention, it was said that Shimada, Yamasaki, Miyakawa, Morita, and Ato physically ill-treated the said civilians by, inter alia, beating them, electrocution, and making them stand in uncomfortable positions. The ill-treatment was said to last for many days and many of the civilians were left with injuries that persisted even after the war had ended. It is well-known that the Chinese population was targeted by the Japanese during the Japanese invasion, but the fact that this case also involved Indian victims reveals that other races in the region also suffered under the Japanese. Shimada, Chokichi. Warrant Officer. From Japanese military. From Japan. Guilty. 10 years' imprisonment. Sentence confirmed. Yamasaki, Yorikazu. Sergeant. From Japanese military. From Japan. Guilty. 7 years' imprisonment. Sentence confirmed. Miyakawa, Gengichiro. Civilian. Interpreter. From Japan. Guilty. 1 year imprisonment and fined $2000 Malaysian Currency. Sentence confirmed. Morita, Yasumasu. Corporal. From Japanese military. From Japan. Guilty. 4 years' imprisonment. Sentence confirmed. Ato, Saichi. Superior Private. From Japanese military. From Japan. 5 years' imprisonment. Sentence confirmed. Dunsford E.H. Captain. From British military. Khan, A.M. Major. Military assocation not stated. B.A., LLB, Lead Counsel. Oshima, Nasayoshi. Civilian. Advocate, Supreme Court of Japan. Lead Counsel. Ward, J.H. Captain. From British military.